I needed a window covering for my guest bathroom and chose a silver colored venetian blind which looked great with my chrome taps, door furniture etc. and my black and white colour scheme. I liked it so much I now have made-to-measure venetian blinds in almost every room in my vacation property! 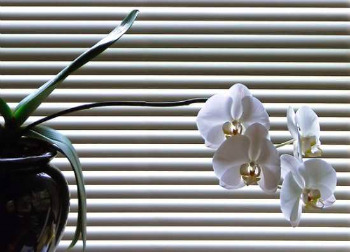 They are so practical and are great for giving guests privacy and keeping the glare of the sun out on a very sunny day. The only down side is keeping them clean. I love your idea of making a padded pelmet as the heading on the blinds is not great and this really does take the 'edge' off the window and gives it a much softer look. Many thanks for the idea and keep up the good work!